Now, in the version 2.9.20, it is now possible to insert another menu at a chosen insertion point in a menu. The live result will be selected according current language. Why this new feature ? Some themes are uneasy to modify and it is impossible to clone the navigation menu location for each language. With this Menu insertion point feature, another menu (structure) (without location) will be live inserted according current language. 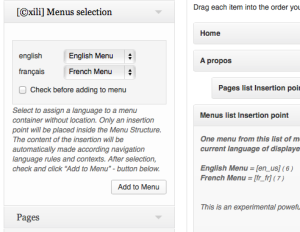 So the resulting menu content will different from one language to another. The first thing to do is to attach a menu structure to a location (named main-menu here for the explanations and attached to primary location). In case of a bilingual location, two menu structures must be created with names like french-menu and english-menu. 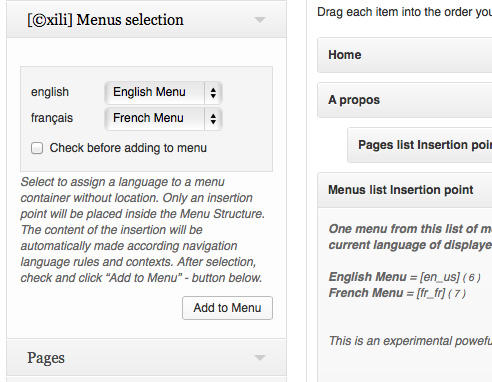 Inside these, menu items can be inserted (by example french pages inside french-menu and …). With these three elements, it is now possible to create the Menu insertion point and place it inside the main-menu. 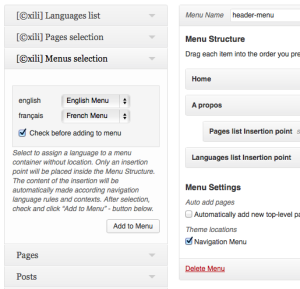 Before adding to menu structure, french-menu will be selected to french and english-menu to english. After adding move the point to the right place inside menu structure. Insertion point can be at every place: on first or second level in menu structure. 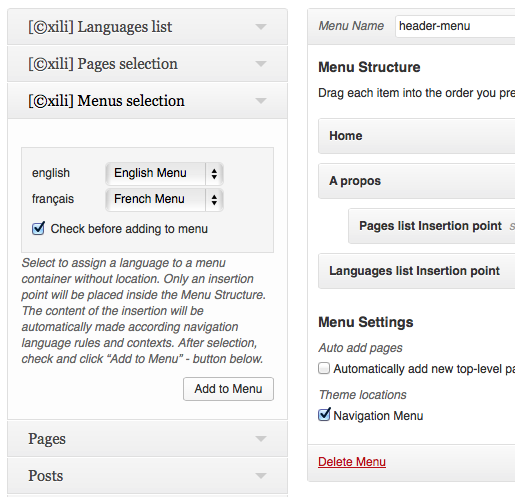 With this nice feature, it is possible to create amazing multilingual menu ! Note: to avoid unwanted side effect, insertion point inside menu assigned to insertion point are not live built. 1.0.2: an improved theme xili-options class, a better UX (user experience) ! “the wind is blowing” with newest version 1.0.1 of this theme twentythirteen-xili !